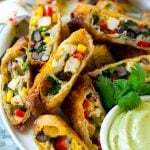 These southwestern egg rolls are loaded with a colorful variety of vegetables, chicken, beans and plenty of melty cheese, all wrapped up in a crispy roll. The ultimate party appetizer! I love egg rolls, whether it’s a traditional Asian style egg roll or a Philly cheesesteak egg roll. 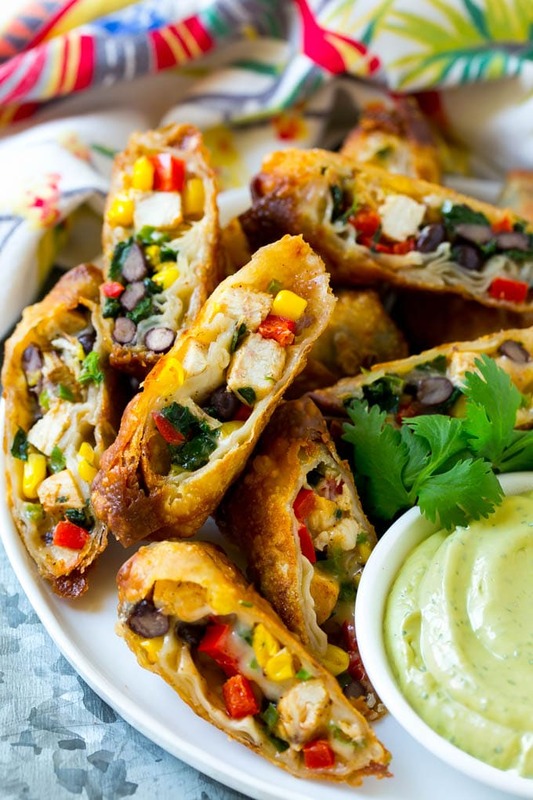 Egg rolls are the perfect hand held food, and this southwestern version is no exception! I love appetizers, in fact, I could make a whole meal of them! Who needs an entree when you can have crispy cheesy bite sized goodies? These southwestern egg rolls are one of my favorite restaurant snacks, and they’re actually super easy to make at home. I also love that you can assemble them in advance, then stick them in the freezer until you’re ready to cook them. You can cook up a few at a time, or fry up a large batch for a party. Did I mention the avocado ranch dipping sauce yet? 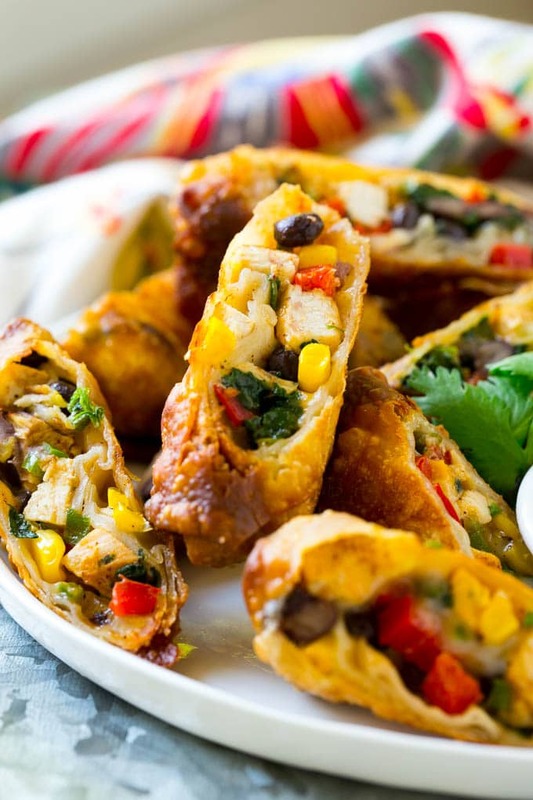 That just takes these southwest egg rolls over the top! 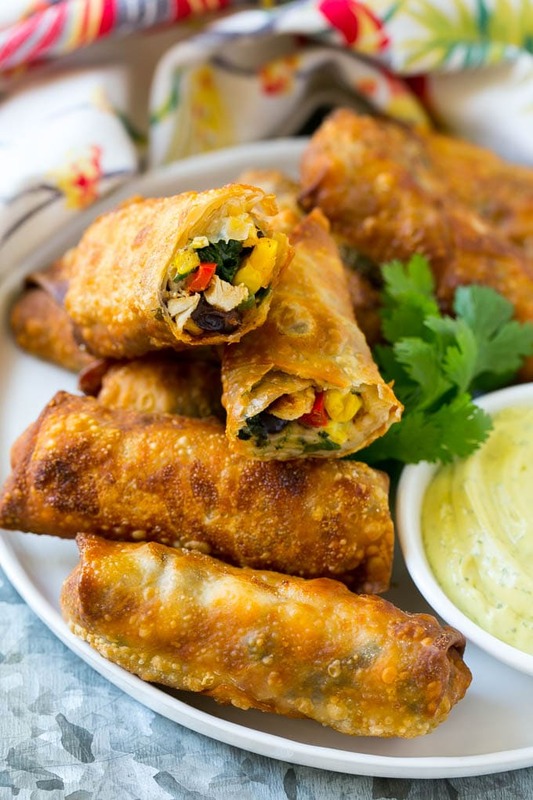 The filling for these egg rolls is made with a combination of cooked chicken, black beans, corn, peppers, spinach and cheese. I used finely diced leftover chicken breast, but you could also use rotisserie chicken if you don’t feel like cooking up chicken for the occasion. All of the ingredients are mixed together with seasonings and stuffed into egg roll wrappers. This was my first time rolling up egg rolls and it was actually easier than I thought it would be. After the egg rolls are all folded up, they go into the freezer. This is an important step because it helps prevent the filling from leaking out during the frying process. It’s also a convenient step because you can assemble the rolls way in advance! I fry my egg rolls in about an inch of oil on the stove top. They just need a few minutes per side to become deep golden brown and ultra crispy. These southwestern egg rolls are served with the easiest dipping sauce. I blend together a simple mix of ranch dressing, avocado and cilantro for a cool and creamy dip that’s the perfect counterpart to the egg rolls. There’s no need to go out to eat when you can make restaurant quality appetizers at home. And I have to say, these southwest egg rolls are way better than anything I’ve ordered at a restaurant! In a large bowl mix together the red pepper, corn, beans, jalapeno pepper, green onion, spinach, cheese, chicken, salt, chili powder, pepper and cumin. Place one egg roll wrapper on a cutting board. Place 2 heaping tablespoons onto the wrapper and roll up according to package directions, sealing the edge with a little water. Repeat the process with the remaining filling and egg roll wrappers. Place the egg rolls on a parchment lined sheet pan. Cover and freeze for at least 2 hours, or up to a month. Heat a large skillet over medium high heat. Pour oil into the pan until a depth of 1 inch is reached. Place 4-5 egg rolls in the pan, do not overcrowd. Cook for 3-4 minutes per side or until deep golden brown, then drain on paper towels. Repeat the process with the remaining egg rolls. While the egg rolls are frying, make the dipping sauce. In a food processor or blender, blend together the ranch dressing, avocado, cilantro, salt and pepper until completely smooth. 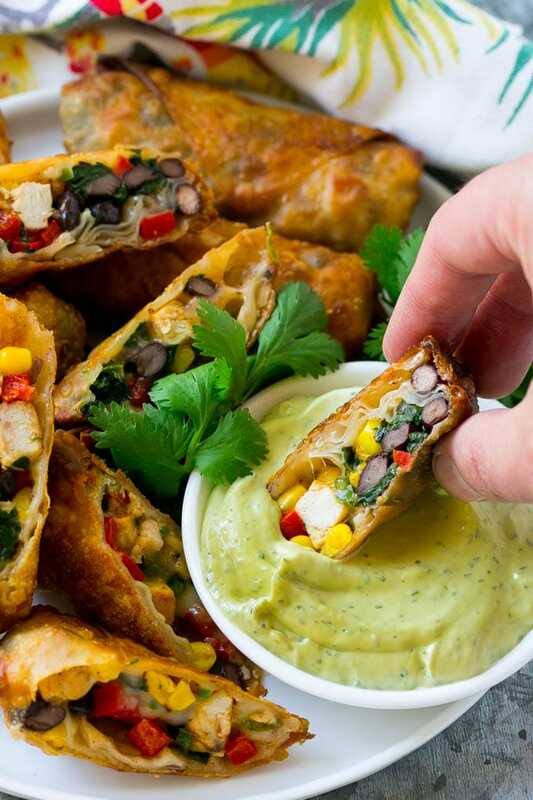 Cut the egg rolls in half on the diagonal and serve immediately with avocado ranch sauce for dipping. Do I have to freeze or I can fry them right away? You can fry them right away! Yes just cook it first and squeeze out any excess water!